WKSTM Raschel Double needle bar Jacquard warp knit: the front and the back needle bars knit both fronts respectively, while the middle jacquard bar joins them to form the seamless garment. Raschel seamless (wksTM) represents the most innovative and unique technology since it incorporates the high productivity of weft knit and the shape flexibility of the flat knit. The WKSTM technique is completely suitable for producing high performance technical clothing, essential in sports as they support muscles and let the body breathe. With this technology it is possible to have endless design possibilities: a great variety of stitches can be achieved by the piezo-jacquard system. Weft and warp knitting are two completely different techniques that produce two different types of fabric. The most obvious difference in these two techniques is that weft is a yarn that runs back and forth, while warp is a yarn that runs up and down. In general, warp fabrics are stronger than weft as the yarns are tightly knotted. Warp is faster than weft and flat knitting, which makes it more likely for commercial knitting fabrics. Warp knitting represents the fastest method to produce fabric from yarn. It differs from weft knitting in that each needle loops its own thread. The needles simultaneously produce parallel rows of loops that are interlocked in a zigzag pattern. Fabric is produced in sheet or flat form using one or more sets of warp yarn. The yarns are fed from warp beams to a row of needles extending across the width of the machine. Unlike with weft knitting, each needle on a knitting machine uses its own loop of yarn to form parallel rows. Another advantage in warp knitting is that the finished fabric can be machine washed with lower risk of shrinkage. As in warp the yarn does not run if cut, the edges can be left unfinished and you can experience greater comfort and a second skin feeling. In the video below you can learn more about the difference between Warp and Weft (we overlook a detailed explanation between the warp knit technology and the flat knit as the great difference in productivity of these two technologies do lead the products to the same level of price competition). 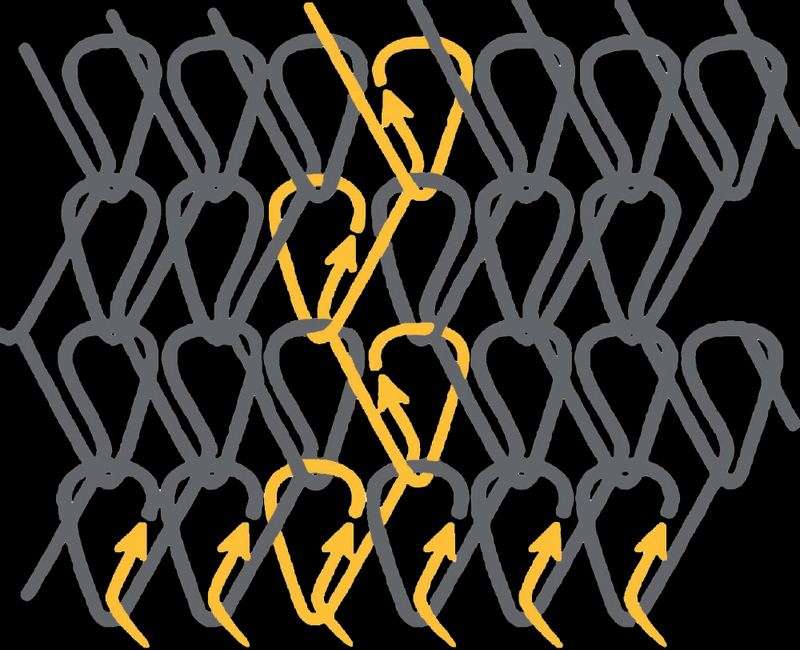 The difference between Warp (WKSTM) and Weft knitting (Santoni Machine) system. In WKSTM there is no diameter. WKSTM is a flat knitting machine of 128 inches in length. The Jacquard system allows to decide the dimension of the diameters. Different diameters can be also knitted at the same time (i.e. : body and sleeves, gloves or leggings). Considering the mechanical elasticity given by the warp knit, you have to respect a tolerance of about +/- 5% in all measures. If you want to learn more take a look at the video below. It is possible to design any kind of pattern or logo, with no limits as far as sizes and silhouettes are concerned. At any time our Cifra style office equipped with CAD technology can make new prototypes upon customers’ indications. For better service and protection the designs are registered by the OHIM (Office of Harmonization for the internal market). With the WKSTM technique items are more resistant, in case of holes or rips the knit does not ravel. This is possible because in warp knit each yarn creates knots, instead in weft knit the yarn just inlay one over the other. Moreover in WKSTM process items come out from the machines almost finished reducing sewing operations. This process cuts finishing costs and the time to market is significantly reduced. Warp knit is the perfect blend of performance, beauty and comfort.